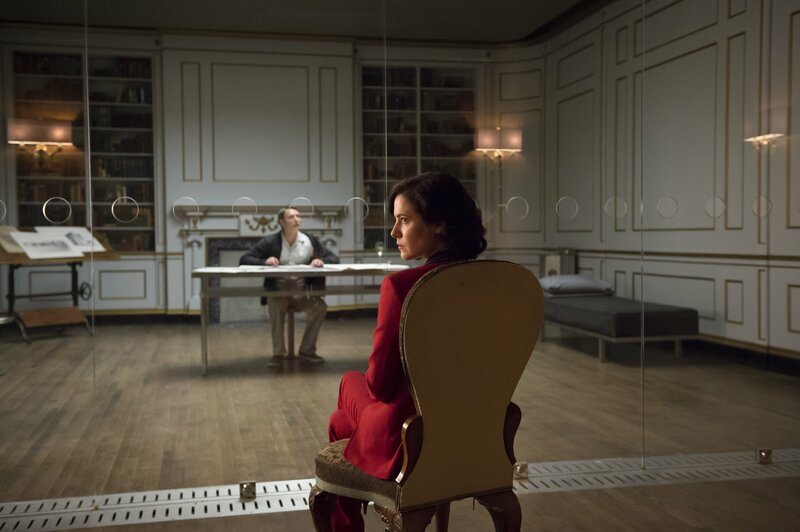 Home / Adaptation / Food / Hannibal / Reviews / TV / [Review] - Hannibal, Season 3 Episode 8, "The Great Red Dragon"
[Review] - Hannibal, Season 3 Episode 8, "The Great Red Dragon"
Remember all that snotty, "I'm saying one thing, but really I know it's another" stuff I was saying last week about it being a series finale? And then I was all "but we've got six episodes left and I don't know because that was beautiful?" Well it turns out I was kind of right. About a lot of it. What was abundantly clear, from the very first moments of this episode were two things. 1) Bryan Fuller has had a clear vision in his head of how he wanted to tell the Red Dragon story since the beginning, and b) this episode felt like the beginning of not just a new season, but almost an entirely new show. I can say the first point with a certain confidence, because we're watching it instead of the three years that we've umped over. Faced with the almost certainty (when they were filming, it's an absolute reality now) that the show would be cancelled, Fuller opted to truncate his initial plans for the show in favour of telling precisely this story. The show has bent over backwards to get us to a place and a condition that Red Dragon can unfold. And I can say the second point with the utmost confidence, because nearly every aspect of the show feels different to the way things have been the last seven weeks. In a way, I almost feel cheated out of a lengthy gap between then and now, so that the abrupt change would feel so much more startling. Hit the jump for the review, which contains spoilers that have found a new life, but the old life harbors in the shadows. Before we talk about what we've got, I want to draw our attention to what we've lost in the fact that NBC cancelled the show, and that it was so likely that they would cancel the show that Fuller changed directions. When the show first began, Fuller said he had a seven year plan. Season one and two were meant to unfold as they did. Season three was essentially what the first seven episodes were, the man hunt. Season four was meant to be Red Dragon, five Silence, six Hannibal, and seven an original epilogue. Fuller has stated that it was the way they broke season two into two sections that convinced him they could truncate those stories into smaller, tighter versions and sheer a couple years off his estimate. Last year, he was still hoping for five. He got three. But in those three, he managed to tell his original prologue, and the entirety of Hannibal and will get through Red Dragon. For economic storytelling, that isn't anything to regret. But the real victim here is the original material. Especially, and what I was getting really excited to see, the stuff that lead up to Red Dragon. All the backstory that Harris waved away with a couple lines of exposition. Stuff that creates no reason to be excited in the novels, but when empowered by the magnificent backstory the series has created, suddenly becomes amazing intriguing. As much as seeing the red Dragon story told is enticing, I find myself much more drawn to the aftermath. Last week saw Will essentially breaking out of an abusive relationship. He's physically beaten, covered in wounds and scars, and mentally he has only just began to reclaim his sense of self. From the ruins of himself, from the calamity of Hannibal Lecter, I wanted to see him rebuild. To meet Molly and begin the process of healing. To sequester his ability to empathize, and find a normal life. Everything that Red Dragon is forcing him to abandon. It is great to jump forward three years, and now say everything is fine. But it means less when we see him slipping back into his old derangement when it was only last week that we saw him thus, and when we have no investment in his climb back out. Fuller is making the best of the situation that NBC has forced him into. The result is the loss of what we know would have been masterful storytelling. I deeply bemoan that we will never see those stories, stories that Harris was interested or capable in telling, and that no one else ever would have considered, but that this show's writers would have set on fire. That Hugh Dancy and Mads Mikklesen would have done remarkable things with. Those are stories we'll never have now. They were stolen from us. And I'm angrier about that then about anything. Because these would have been stories worth having. They would have made us better. Red Dragon is the most conventional the show has ever been. In fact, it's like we're right back at the the beginning, before the show had broken out of its shell and reveled in the sun in its own full glory. It feels like the show that NBC thought it was buying, one with a recognizable formula. One with an inhibited sense of self. One that follows the rules. Part of that is Neil Marshall's highly competent direction, a panning and lingering sense of space and framing that works wonders fro this more distant and detached reinvention of the series. It stands in stark contrast to the maniacal whimsy of Vincenzo Natali's direction, which set the course for the first half of this season. Marshall's work is almost clinical; sterile in a way that captures Will's cordoned off personality. As the episode progressed, as Will slipped into his dementia like a comfortable glove found in the pocket of a long unworn coat, so too did the camera begin to tilt at reality's windmills. Marshall only glimpsed at the madness waiting at the bottom of the well. Three years have passed, and it turns out that not much has changed. People don't change, not really, but when they do, they rarely change back. Will hasn't changed, he suppressed. Like an addict, he forces himself not to revert. But Jack, despite Bella's death giving him new perspective on life, has fallen back into his familiar habits, and is once again at the FBI, and is once again asking more of Will then is reasonable. Alana remains as we left her, a changed woman after Hannibal's influence. The sort of person who no longer trusts any beer after a particular brand caused her to loose her taste for it. She used that new, cold, pessimism to take over control of the State Hospital. Chilton has what he wanted, fame and notoriety, though he still lacks any ability to achieve it on his own. His lack of position challenges his authority, which the show has already established was practically nonexistent. He's now a freelancer, like Will, someone to be drawn into Hannibal's gravity. The new addition (the episode saw the welcome return of lab flunkies Zellers and Price, and hinted at Freddie Lounds still poking about) is Francis Dolarhyde, played by Richard Armitage. The script keeps him speechless for the entire hour, emitting only an animal scream at one point. It is a salient introduction, and allows his actions and the other's interpretations to speak for him. More writing should be like this, should be this self assured. Dolarhyde, like Hannibal, is a force that reaps itself upon the world. He isn't as powerful as Hannibal; more a gale running up against a hurricane, but it helps us to know that he is not a killer-of-the-week, which Will and Hannibal so ably dispatched back in earlier seasons. He has something greater to offer. The real problem that I had with the episode was how strict it was. It felt like the first part of a movie, offering a fairly straight forward and mostly faithful adaptation - not interpretation - of the source material. The execution is still undeniably this show's own brand and style, but the method feels very unlike how they've approached things before. Hopefully, in the five remaining episodes, as the show must course correct around the aspects of the novel they've already put to use, that the show finds its own original way of recounting these events. I have faith that it will be thus. What you said about how the show could have explored original material in the aftermath of Hannibal's surrender interested me. I could see working it as the second half of S3 which would have shown Will trying to rebuild his life free of Hannibal and Hannibal going through the motions of his confinement until his attention is drawn to the Tooth Fairy killings. Then the whole season could have concluded with Will and Hannibal's Red Dragon meeting.